Yale graduate and history enthusiast Hiram Bingham was shocked when he discovered the Inca ruins of Machu Picchu in 1911. How could such a spectacular site have gone undiscovered for so long? Of course, the answer is that it hadn’t gone undiscovered. All the locals knew about it. Word simply hadn’t made its way out to the wider world. I’ve been traveling throughout Peru since I moved here a year and a half ago. And I must admit that I understand how Bingham felt. For many North American expats like me, Peru remains the great undiscovered Latin American marvel. But unlike in 1911, you don’t need to travel to the top of a mountain to find proof of it. 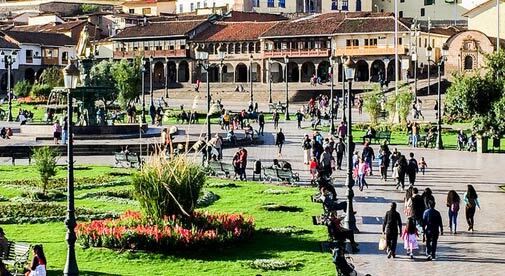 Peru is the fastest growing economy in Latin America. In 2015 the GDP of Peru grew by 3.3%, while in 2016 the growth exceeded 3.7%. Good export diversification, growth in commodities, and political stability have all contributed to this new boom. But most significantly for expats looking for business opportunities, Peru has a burgeoning tourist industry. This year the number of visitors was 3.5 million. But the government has already set a goal of 7 million tourists per year by 2021. It’s also an incredibly low-cost country to live in, and there is very little in terms of encroaching business regulation for startups. Ricardinho De Sousa Hdez-Mora, originally from Spain, has lived in Lima, Peru’s capital, for two years and is the co-owner of Peru Social with his partner, Allen Maye Mercado. They offer tourists a variety of exploration and volunteering packages. “It really doesn’t matter what skills you bring with you to Peru. If you can perform good quality work or provide a service, at a fair price, and meet or exceed any deadlines, you will probably succeed here,” says Ricardinho. Less than 5% of the tourists who come to Peru travel anywhere north of Lima. But Liam Malone is attracting a few of them to his small Airbnb that he opened several years ago in the northern city of Chiclayo. Renting out a few rooms of their apartment and passing on their knowledge about the local area helps pay the bills and brings a steady flow of interesting visitors. Chiclayo enjoys year-round sunny skies and average temperatures in the 70s F. Pimentel Beach on the Pacific coast is only a 15-minute drive away. “I was in Argentina for a while as an English teacher” says Ben Reilly, who opened an English as a Second Language (ESL) school in Cusco three years ago. “I started teaching in Buenos Aires, but I thought it was a bit too similar to Europe. I wanted to live in a place a bit more authentic, so I came here. “It started out as just me in my apartment teaching, and then it grew organically into the school I have now. I didn’t really invest any large amount of money. I just reinvested any money that I made over the years. What Does It Cost to Retire in Peru?